Justuno’s proprietary visitor intelligence technology analyzes billions of data points every second to create intelligent visitor profiles that identify, track, and analyze every person who lands on your website. With this core data powering every layer of our platform, Justuno’s AI-driven suite of conversion tools enables you to create highly targeted and refined customer journey touchpoints that capture and convert leads faster than ever before. As the number of devices and marketing channels used by consumers continue to grow, unifying your consumer data to create accurate visitor profiles is more important than ever. 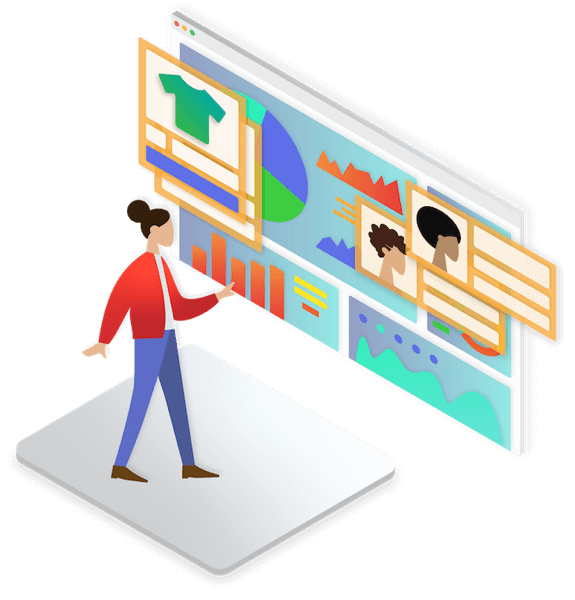 Justuno’s intelligent visitor profiles marry behavioral session data, visitor profile data, and transactional and product data to not only identify your visitors, but to deliver powerful and actionable insights based on the entire buying journey. Our proprietary profile tracking technology creates an intelligent profile for every unique visitor on your site — following their purchase patterns and behaviors across your website — in order to divide and organize your website traffic into highly-segmented audiences for targeting. Combining the power of your audience’s onsite micro-interactions with insights gathered from billions of additional user sessions, Justuno organizes and analyzes your data to present in-depth and straightforward reporting and analytics. Collecting over half a billion new data points every month, our AI-powered core technology continuously tests, learns, and improves its predictive targeting and audience segmentation in order to layer strategic, intelligent recommendations into every product and feature we build. As we continue to unveil increasingly powerful AI-driven features, our core technology will further help your business discover hidden segments and new opportunities. Data is the core of our business and is layered throughout every piece of technology we build. Harnessing the power of data-driven AI, our predictive targeting engine draws insights from your website’s intelligent visitor profiles in order to build highly-segmented audiences and targeting rules. We go beyond identifying your visitors to deliver comprehensive journey analytics and actionable insights that help you deliver a personalized and holistic buying experience — not just a touchpoint. From affinity and behavioral data to purchase and events data, we aggregate all available touchpoint information from a user’s journey, so you can serve highly-targeted personalized messaging across all of your marketing channels. An advanced solution for enterprise-level marketing. Get exclusive access to our most powerful features, as well as ongoing strategic insights for more complex and advanced marketing campaigns with our Justuno Plus plan. Finally, a more advanced plan for the more advanced marketer. Why iterate when you can automate? Our AI-driven cross-sell and upsell promotions continually learn your visitor’s purchasing patterns and behaviors to deliver the most relevant recommendations. Available exclusively on our Justuno Plus plans, learn how you can increase your conversions while our technology does the hard work for you.